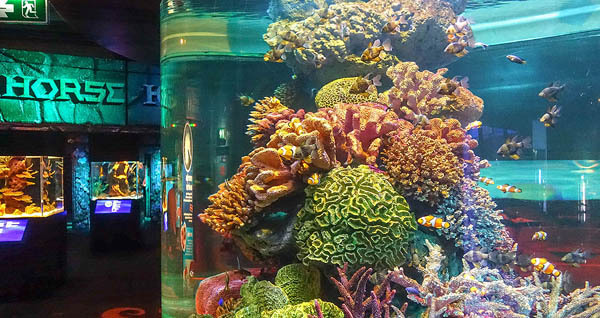 Sea Life Ocean World Ocean World is a large aquarium in the center of Bangkok where visitors can enjoy the sight of impressive and beautiful marine animals as giant crabs, stingrays and sharks from up close. 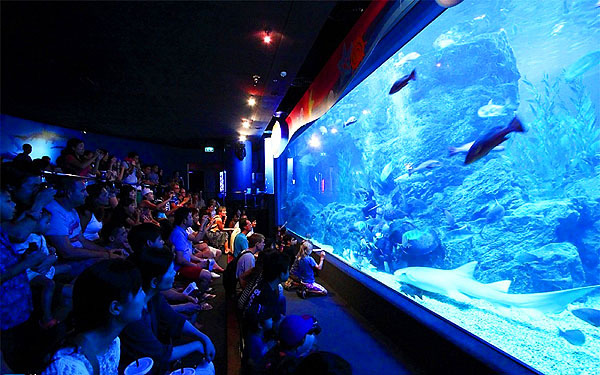 The aquarium provides a memorable experience and a fun outing for the whole family and a chance to see thousands of fish and other aquatic animals in an air conditioned and cool environment at a very easy to reach location in the center of Bangkok. Large variety of aquatic life The aquarium harbors an amazing variety of aquatic life including sharks, stingrays, penguins, sea horses, colorful corals and tropical fish. 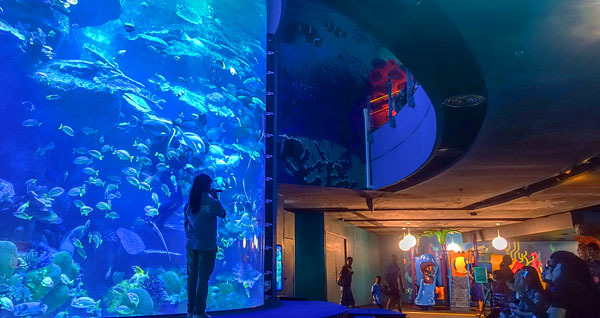 The well laid out aquarium is divided in sections, each with a different theme. Next to the exhibits are information boards in Thai and English. 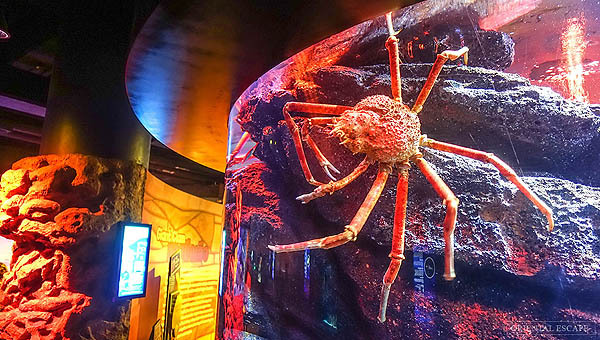 Exhibits with different themes The first exhibit on entering Ocean World is the Rocky Hideout where several enormous crabs and octopuses live. 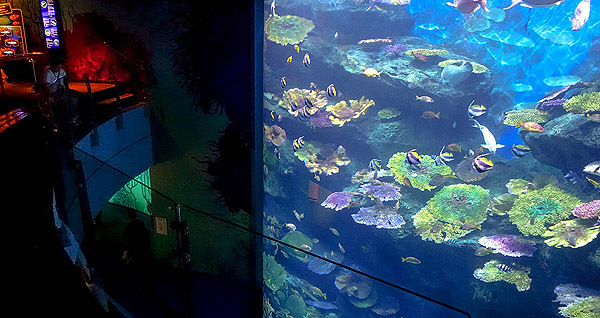 At the Coral Reef visitors can admire the variety of colors and shapes both of many species of corals as well as tropical fish such as the orange and white clownfish and the venomous lionfish. Several colorful species of sea horses can be seen at the Seahorse Kingdom. Fish of the Tropical Rainforest A number of large fish species live at the Tropical Rainforest, an area that looks like a lush jungle with waterfalls. 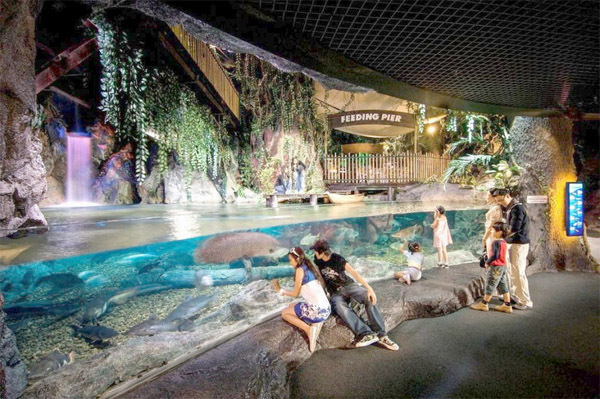 Among the fish that live here are several species from the Amazon rainforest like the Arapaima, the largest freshwater fish in the world that can reach a length of up to 15 feet. Walk between the fish in the Ocean Tunnel One of Ocean World’s highlights is the Ocean Tunnel that gives one the feeling of walking on the ocean floor. 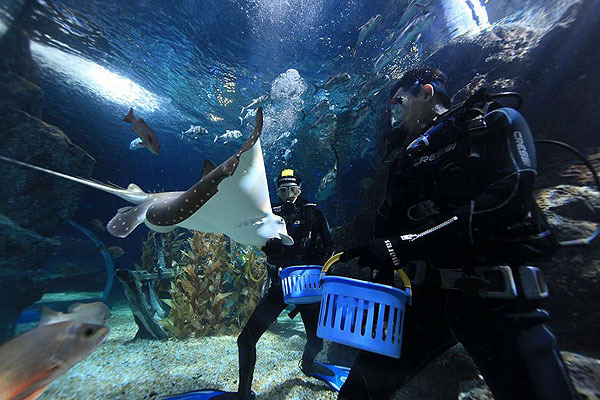 See from up close large sharks, stingrays and schools of tropical fish. 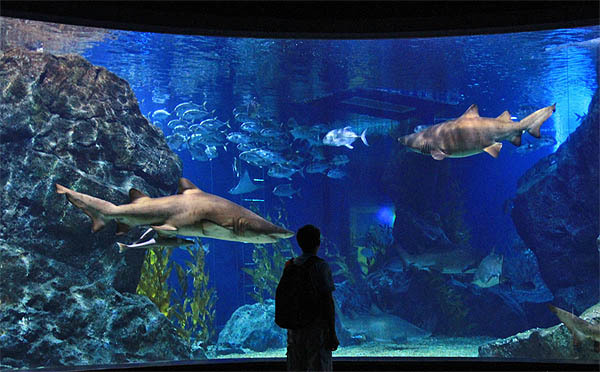 Walk through a glass tunnel surrounded by water towards the Tropical Ocean, a huge aquarium with the “Ship wreck”, a man made sunken ship where several species of sharks hang out. 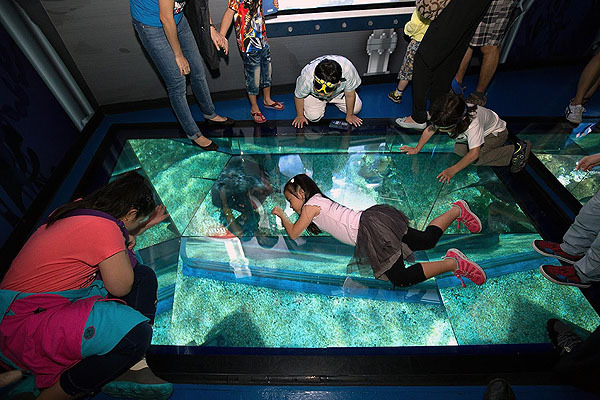 Another place to watch sharks is the Shark Walk where you walk over a transparent floor over a tank where several species of sharks live including leopard shark, sand tiger shark, white spotted and blacktip reef shark. The Ice Adventure area filled with ice and snow is home to Gentoo penguins, a fairly small species of penguins that live in Antarctica. 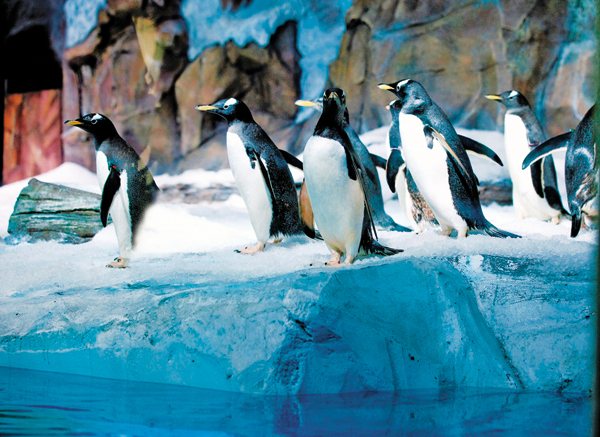 Another species of penguins, the Jackass penguins or African penguins can be seen at the Rocky Shore. Watch how quick they swim right in front of you. These very sociable animals seem to enjoy the interaction with visitors. Throughout the day there are feeding shows at various locations. Have your photo made by a professional photographer that wait at several locations. Photos can be bought in the souvenir shop. About halfway through Ocean World in a jungle setting is the Rainforest cafe for a coffee and a snack. Activity for kids A fun activity for children is embossing the Sea World aquarium booklet. 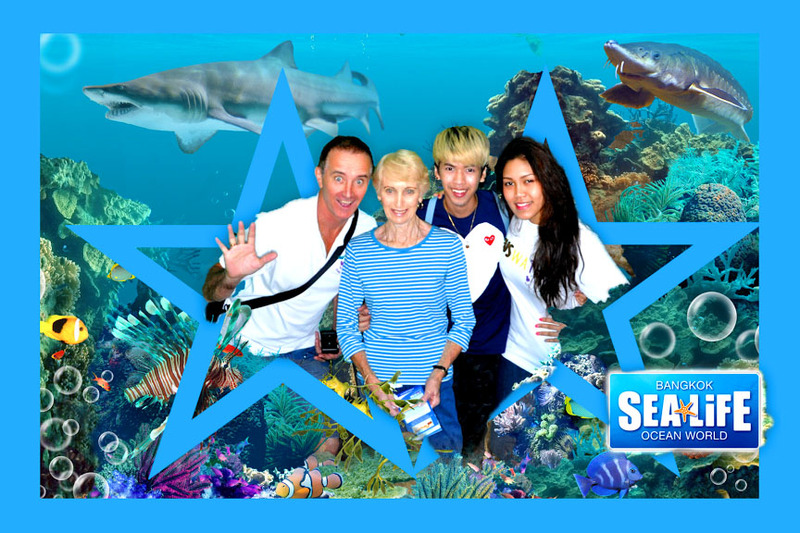 At 9 locations in Sea World kids can emboss the booklet and learn a little at each stop. When the activity is completed, they receive a gift. Ask for the booklet at the ticket counter. 4D Cinema At the 4D cinema visitors can watch a 4D movie about people on an island inhabited by dinosaurs. Included with the movie is a Pepsi and popcorn, to be picked up at the Rainforest cafe. The movie is shown from 11.30 am until 8.30 pm. Ocean feeding boat The glass bottom ocean feeding boat provides the unique experience of getting very close to sharks. Watch them swim around the boat, their fins appearing over the surface. A member of staff points out the various species. The ocean feeding boat tour can be done from 10.30 am until 8 pm. Swimming vests are provided. Diving with the sharks Get even closer to the sharks, stingrays and many colorful species of tropical fish taking a dive accompanied by a Ocean World trainer. 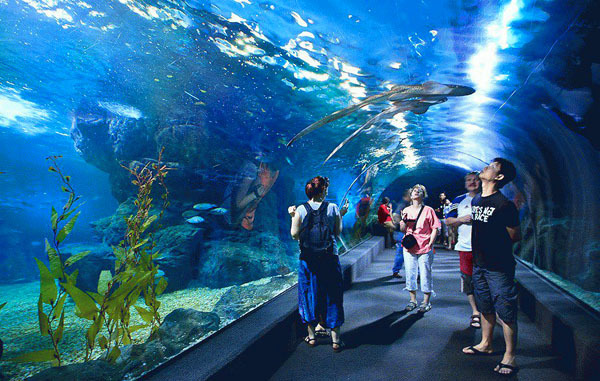 Ocean walker Get up close to many species of aquatic life including rays and sharks walking in the underwater tunnel. Behind the scenes tour Take a tour behind the scenes of Ocean World and get to know how the place works. Visit the aquatic quarantine and nursery center. 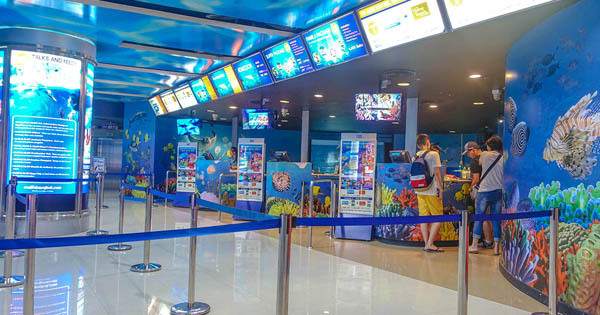 Location and how to get there Ocean World is located in Siam Paragon shopping center on Rama I road, Pathumwan Bangkok. It is found on level B1, get there with the escalators at the food court. The easiest way to get there is by BTS Sky Train. Siam Paragon is located right next to Siam station. Opening hours Ocean World opens daily from 10 am until 9 pm. Last entry at 8 pm. For children Under 2 years old will be Free of charge. For children 3-11 years old whose height must not exceed 80 cms we charge 85% of the price that calculate from a total number of adult pax. For children over 11 years we charge normal price.